LabradorAs predisposed as I am towards things Swedish, melancholic, and anthemic, it took me a little bit to warm to Jönköping’s Mary Onettes because, well, their name is pretty awful; thankfully, their music is most definitely not. Their 2009 album Islands was a glorious thing, all Cure-meets-Bunnymen ’80s romantic angst in stadium dress. And as happy as I’d have been to have more of the same, the band has other ideas. Their Love Forever EP released back in February made public the first fruits of their sessions with Swedish über-producer Dan Lissvik, probably best known in these parts for helping make Shapeshifter a game-changing record for Montreal’s Young Galaxy. While it doesn’t sound as though he’s been as transformative with The Mary Onettes, Lissvik’s fingerprints are clearly audible from the distinctive gleam about each sonic element – it doesn’t sound so much like the ’80s as what the ’80s thought the future might sound like. Love Forever did fine as a teaser, and we won’t have to wait long for the main feature. 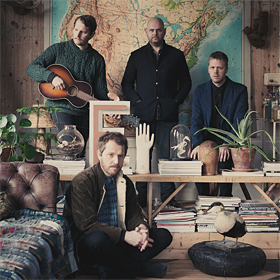 Their third album Hit The Waves will be released on March 12 and a track from it has been made available to stream. Give it a listen below, along with the Love Forever material, and get anxious. Correctly interpreting their sold-out show at The Drake in October as demand, Niki & The Dove are responding with supply via a North American tour that brings them back for a show at Wrongbar on January 16, tickets $15 in advance. There’s also a feature interview at Filter. NPR has a video session with Jens Lekman, who also chats with The Phoenix New Times and The Dallas Observer. Culture Fly has an interview with Amanda Mair. Icona Pop have released a new video from their self-titled debut, out now in Sweden and sometime next year in the rest of the world. They’re also interviewed by The Daily Beast and Buzzine, and will be at The Kool Haus on December 1 opening up for Marina & The Diamonds. Matador has announced the signing of Danish post-punk young’ns Iceage. Their as-yet untitled second album will be out on February 19. The Line Of Best Fit has an interview with Björk. Sigur Rós are almost done with their Valtari Mystery Film Experient – this “Varúð” clip is the second-last one, and the final one should be out before they’re screened in film form in a couple weeks including December 8 at The Bloor. They play The Air Canada Centre on March 30. Bowery Presents got Of Monsters & Men to perform an acoustic session on the rooftop of the Music Hall of Williamsburg way back in the Spring. But they’ve only posted it now. ← The National watches TV. They’re just like us!